It's almost here: the big day! If you're two months or less away from your walk down the aisle, you want to make sure that your dress fits absolutely perfectly. Now is the time to schedule your appointment to have your dress fitted. Have the bodice measured and the length hemmed. It is very important to bring along your bridal shapewear to this appointment! Otherwise, it may be too loose on the big day. Don't forget your shoes as well, so your seamstress can adjust accordingly. You'll be fitted again in a few weeks to make any final alterations. Is your waist trainer not feeling as tight as it used to? Don't hesitate to order a smaller size so that you can continue to fine-tune your figure! You might be enjoying a bridal shower around this time. Wear a dress that really shows off your waistline. 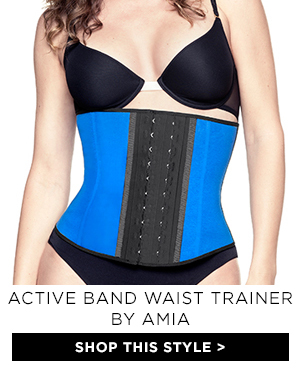 While you're waiting on the alterations, it is very important that you continue to keep up your waist training regime on a daily basis, as well as a healthy diet and exercise. For the next few weeks, you may want to especially focus on toning your arms so that you can show them off. If you have been waist training for a few months, you should be comfortable with wearing your garment 10-12 hours a day. If you haven't already, now is the time to break in your shoes. Practice wearing them for a few hours at a time. Your waist trainer will help you maintain good posture. Your dress should now be ready for the final fitting. Again, bring your bridal shapewear to wear underneath. At this appointment, the dress should fit perfectly or be very close. Bring along a friend who can help create the bustle. You might be feeling the stress of the upcoming event—don't let it get to you! Keep up your healthy lifestyle, especially getting enough water so you can really glow on your wedding day. This week will be a blur! Take lots of pictures, including an "after" picture so you can see your waist training results! Keep that waist trainer on hand—you'll definitely want it on for the rehearsal dinner, bachelorette party, and any other special events. We hope you enjoy a very special wedding day, full of joy and confidence in your own skin. Waist training is just one part of the journey. If you're a bride or a bridal party member who has benefited from waist training, we want to know about it! Tag us and share it using #BeTheHourglass #HourglassBride #HourglassBridesmaid.